A microscope is an optical instrument used to help the eye see very small objects, where the tiny objects are difficult to observe directly using eyes or loupe. There are two types of the microscopes namely light microscope and electron microscope. This lesson discusses the light microscope, and the way it works about the topic of geometry optics includes refraction of light, the formation of images and the magnification of images of an object using a lens. A simple light microscope consists of two convex lenses. 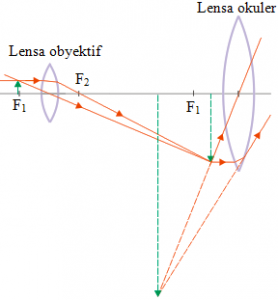 The convex lens that has a distance closer to the object that is observed is called the objective lens. The convex lens that is closer to the observer’s eye called ocular lens or eye lens. The object is tiny, so even though they are observed from the near point, 25 cm apart, the angle formed between the eye and the object is very small. Therefore the objective lens functions to magnifying the image of the object and magnifying the angle between the eye and the image of the object. Images produced by objective lenses must be real to be seen through the ocular lens. So that the image produced by a convex lens is real, the object distance (do) must be greater than the focal length. Likewise, so that the image is larger than the object, the object distance must be near the focal point of the objective lens. The image produced by the objective lens is real so that the image can be considered as an object by the ocular lens. The function of the ocular lens is to magnifying the real image produced by the objective lens to be greater. The ocular lens is a convex lens because as explained in the topic of the convex lens, so that the image produced by the ocular lens is huge and upright, the image must be virtual. Is the image size of objects seen through a microscope greater when observed by eyes with minimum accommodation or maximum accommodation? Which should be used as an objective and ocular lens, a convex lens that has a large focal length or a convex lens that has a small focal length? These questions can be answered after you learn the equation of the microscope.